The notable adventress Telliandre the Ebon-Tressed always managed to be well dressed wherever she went. Her skill with the blade was a well known as her wit and her ability to get into -and out of- compromising situations. These dresses are well made, always appearing in the latest fashion. They are usually black when first found. In part 1 of my SHADOWFIST CCG gabfest, I talked about the conceptual background of the game which is shares with the Feng Shui RPG (published by Atlas Games). This time I am going to talk a bit about the structure of the game itself. 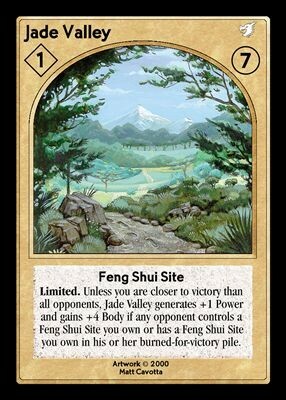 The path to victory in SHADOWFIST is control of Feng Shui sites (from here on FSS), these are represented by cards and they also provide your resources in the game (a very rough analog to lands in M:tG). In a duel (two-player game) you need six sites for victory and in multi-player games, you need five. However, you need to take that final, winning site from an opponent. Many FSS provide additional abilities from the way they focus Chi, some defensive, some utility and a very few offensive. Generally, the more potent the special ability, the harder the site is to defend. So the mix of FSS in your deck are important. Each turn your FSS generate power which is used to purchase things, unlike some games, power can be saved from turn to turn in order to play bigger and better things. Read the rest of this entry ? If you wish to understand the Summoner class and to expand the options available to these magical masters, the Summoner’s Circle is an excellent sourcebook. Summoners and conjurers will especially benefit from the feats but others will too. The Summoner’s Circle: Advanced Feats is a 19-page PDF (17-pages if you remove the cover, ad and OGL page) for the Pathfinder RPG written by Sigfried Trent and published by Open Design. This is part of Open Design’s Advance Feats line for Pathfinder. The necrourgist moved among the recent dead, chanting and flashing a crystal on a silver chain. The bodies of the freshly slain occasionally twitched as the chant hit a high point. At the conclusion of the chant, he held the crystal high and wisps of twisting spritstuff were pulled from the bodies into the crystal. 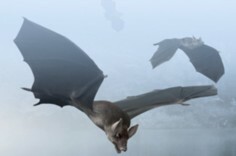 They came in the night, riding huge nearly silent bats and struck by surprise. They killed the watchers and stole away with treasures and valuables before anyone realized they had come. Now everyone lives in mortal fear that they will return watching the sky at night for any sign of them. These harnesses are made of night black leather with blued steel fittings chased with silver. They make almost no noise, even when jangled. Once a night, the owner may summon a riding bat for three hours. The holder of the harness gains a +3 competence bonus to ride checks when mounted on the bat. Treat the bat as a dire bat with DR 5/magic that can carry 198 pounds as a light load, 399 pounds as a medium load, and 600 pounds as a heavy load. If the summoned bat is slain, the bat may not be summoned again for one week. Our young scout came running back chased by these small screaming faces trying to bite her. Leaving trails of blood in the air the snapped and bit at anyone they could reach. Our wizard was bitten and began swinging his staff in a mad frenzy. Soon enough we defeated the annoying creatures. These spiritual fragments are bound by necrourgists to serve as guardians or tools. Appearing as flying blood red screaming faces trailing a tail of spectral blood droplets that vanish. Cover: Classic line of heroes on the left, Hi-Q nearest and Bald Eagle farthest away, against line of villains on the right, Professor near and wings far, with ‘Against the Power People’ emblazoned across it. You are currently browsing the Sea of Stars RPG Design Journal blog archives for May, 2011.